Step 1 Heat the oven to 450 degrees. Cut the top off the pumpkin and quarter it. Remove the seeds and the guts and set aside the seeds. Toss the pumpkin quarters in 2 tablespoons of the olive oil and season each piece with a good pinch of salt and pepper. Place the pieces in a baking dish. Bake the pumpkin until the flesh inside is soft enough to scoop out with a spoon, about 30 minutes. Allow it to come to room temperature, then scoop the flesh from the shell and discard the shell. Step 2 While the pumpkin is baking, toss the pumpkin seeds with 2 tablespoons of the olive oil. Spread the seeds on a baking sheet and place them in the oven (on a separate rack from the pumpkin). Bake the seeds until they start to brown, 5 to 10 minutes. Remove from the oven and season with a pinch of salt. Set aside to garnish the final soup. Step 3Set a medium stockpot over medium heat and add the remaining 2 tablespoons of olive oil. When the oil is hot, add the carrot, onion, celery and garlic and cook, stirring occasionally, until they are softened and the onion is translucent, about 10 minutes. Add the sage and cook, stirring, until the sage is aromatic, about a minute. Step 4Add the sweet potato to the stockpot with the sauteed vegetables. Add the nutmeg and bay leaf. Pour in the chicken broth and add the pumpkin flesh. Bring the liquid to a boil, then reduce the heat to low and simmer until you can run a knife through the sweet potato, about 15 minutes. Step 5When the potato is softened, discard the bay leaf. Puree the soup using a blender (this may need to be done in batches), and strain into another pot. Taste the soup and season to taste with salt and pepper. Step 6Stir in the cream and butter. Bring to a good simmer, then reduce the heat to low and gently simmer to prevent burning, until the soup is reduced and thickened to your liking, about 10 minutes. This makes about 8 cups soup. Step 7To serve, ladle the soup into bowls. 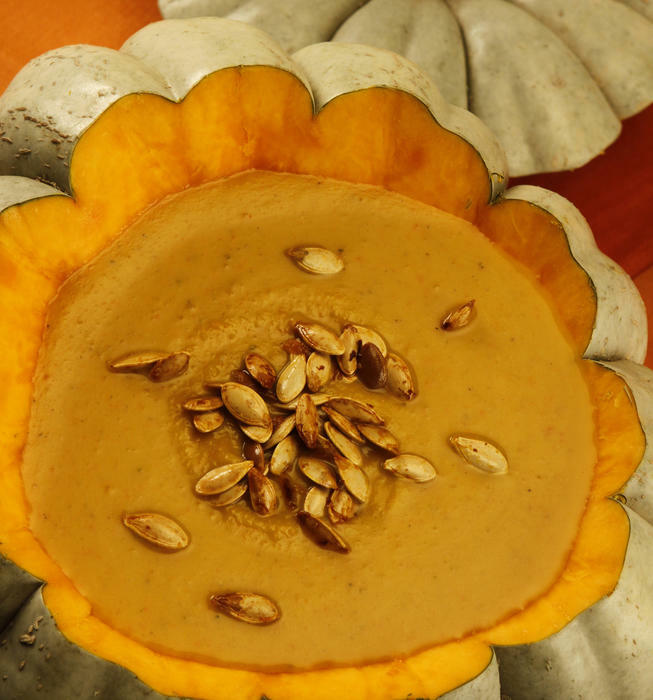 Garnish each serving with one-half teaspoon of the pumpkin seeds and one-half teaspoon pumpkin seed oil, or as desired. In Recipes-list.com we have selected the most viewed recipes from category - Main courses Soups . Enjoy the best recipes specially selected for you! Pumpkin soup is the right choice that will satisfy all your claims.